Marshall University offers a variety of merit-based scholarships to students who demonstrate outstanding academic achievement. Most merit-based scholarship programs require that you be enrolled full time, maintain a minimum GPA, and complete 30 credit hours each academic year. Most scholarships are renewable, but some are not. Be sure to read Important Information About Scholarships for deadlines and additional detail on the terms and conditions of scholarships by clicking here. To download a copy of Marshall University Merit-based Scholarship policy (for the prior academic year), click on the link below. While care has been taken to provide accurate and current information about Marshall University scholarships and grants, the information on this website is subject to change without notice. The following financial aid programs are available to students who demonstrate financial need based on the results of the Free Application for Federal Student Aid (FAFSA). Federal Pell Grant – awarded to undergraduate students pursing their first undergraduate degree. Federal Pell Grant award amounts vary depending on the student’s enrollment status: full-time, 3/4-time, 1/2-time, and less-than 1/2-time. 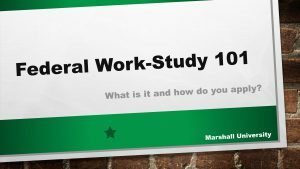 In most instances, Marshall University initially awards Federal Pell Grant based on projected full-time enrollment. The census date to determine students’ enrollment status for Federal Pell Grant eligibility is the first day following the last day to add a class for the semester or term. When the enrollment status is different on census date than when the Federal Pell Grant was originally calculated, the Federal Pell Grant award is subject to change. 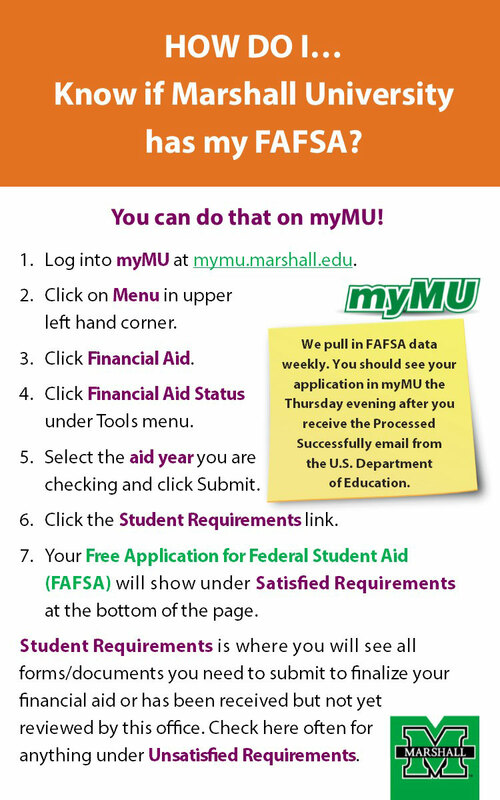 If Marshall receives a student’s processed FAFSA after the census date, the student’s enrollment status on the date the FAFSA was processed must be used to determine Federal Pell Grant eligibility. When a student does not begin attendance in all of his or her classes resulting in a change in the student’s enrollment status, Federal Pell Grant must be recalculated. Students may receive up to 150% of an annual Pell Grant during an academic year but no more than 50% of an annual Pell Grant during any semester or term. There is a maximum lifetime period for which a student may receive a Federal Pell Grant, which is known as Pell Lifetime Eligibility Used (LEU). The maximum lifetime limit for Federal Pell Grant is 12 full-time semesters or its equivalent measured by the percentage of the student’s scheduled award used or received each award year. Federal Supplemental Educational Opportunity Grant (SEOG) – awarded to Federal Pell Grant eligible undergraduate students pursing their first bachelor’s degree. Federal SEOG academic year award amounts vary depending on the student’s enrollment status. For example, if the full-time award is $500 then 3/4-time is $375, 1/2-time is $250, and less-than 1/2-time is $125. Priority SEOG awarding is given to Pell eligible students who have the lowest Expected Family Contribution (EFC). Due to limited funding availability, typically only Federal Pell Grant eligible students with a zero EFC are awarded Federal SEOG. WV Higher Education Grant (up to $2,700 per academic year) – Recipients must be U.S. citizens, WV residents (student and parents) for 12 months immediately prior to April 15 preceding the academic year of enrollment. Students receiving WV Higher Education Grant must demonstrate financial need, enroll full time and maintain a minimum 2.0 grade point average (GPA). In addition, students must earn a minimum of 24 credit hours to renew the grant. The maximum number of semesters or equivalent the student may receive WV Higher Education Grant is 8 semesters (or 4 years). Students must file the FAFSA by April 15 prior to the academic year the student plans to enroll. WV Higher Education Adult Part-Time Student (HEAPS) Grant ($675 – $2025 per academic year) – awarded to part-time WV residents (resident for a minimum of 12 months) who demonstrate financial need and maintain a 2.0 grade point average. Funding for this program is limited; therefore, all part-time WV students who qualify will be considered to the extent of funding availability. Marshall University Achievement Tuition Waiver Grant for Incoming Freshmen (award amounts vary). For many students and families, borrowing educational loans is a necessary part of paying for college. Educational loans are available to undergraduate and graduate students as well as parents of undergraduate students. Student loan borrowing is an investment in your future. 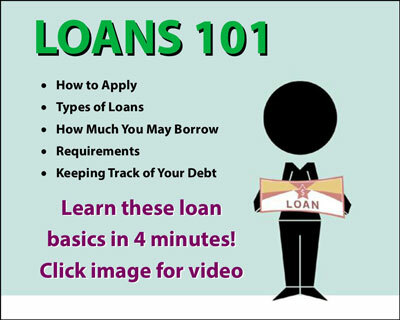 When deciding to borrow, it is important you obtain the best possible loans available to you in terms of interest rates and terms of repayment. When taking out a student loan, you should only borrow an amount that you absolutely need to keep your loan indebtedness as low as possible. Remember you have to repay these funds with interest at a later time and will want to have a modest loan repayment amount when that time comes. If you decide to take out a loan, make sure you understand who is making the loan, as well as the terms and conditions of the loan. Student loans can come from the federal government or from private sources such as a bank or financial institution. 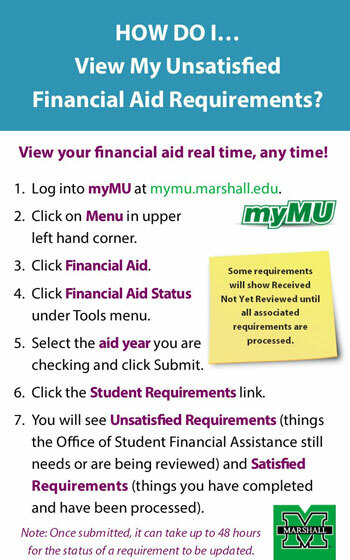 Although Marshall University does not provide the funding source for these loans, the Marshall University Office of Student Financial Assistance has responsibility for certifying your eligibility for these loans. Loans made by the federal government, called federal student loans, usually offer borrowers lower interest rates and have more flexible repayment options than loans from banks or other private sources. Learn more about the differences between federal and private student loans. Students and families should receive trustworthy, reliable guidance from institutions about financial aid, including educational loans. Marshall University enforces a Student Loan Code of Conduct as a framework to provide the best possible loan terms for students and to avoid conflicts or the appearance of conflicts of interest. 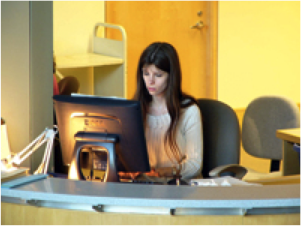 Near Campus Opportunities: Students are often able to find work in the surrounding communities. To assist you with your part-time job search, we suggest you create and maintain your resume and profile with Marshall JobTrax. Please contact Career Services at 304.696.2370 for assistance. Federal Work-Study (FWS) is a program that provides jobs for undergraduate and graduate students demonstrating financial need. While most Federal Work-Study positions are located on campus, there are numerous opportunities for students to work off campus performing community service work at nearby non-profit agencies. Click here for a list of community partners that have agreed to employ FWS eligible students. The amount of your FWS offer as indicated in your Financial Aid Package is the maximum you are allowed to earn over the course of the academic year. You will be paid directly for FWS earnings every two weeks. FWS awards are not credited to your student account. FWS earnings are excluded from income on your subsequent year’s Free Application for Federal Student Aid (FAFSA), so they don’t affect your eligibility for financial aid in the future. Due to limited funding under the FWS Program, the Office of Student Financial Assistance is only able to place about 275 students into FWS part-time jobs each year. As funding limits permit, FWS awards are offered as part of the annual financial aid package created prior to the start of each academic year. A FWS Wait-list is maintained in the event that students initially selected for FWS decline their awards and funding is made available to award additional FWS eligible students. Students placed on the FWS Wait-list are typically not awarded until the spring semester. 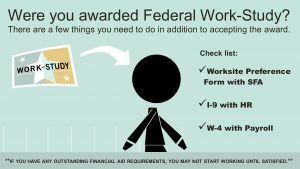 To be put on the 2018-19 FWS Wait-list, you must download and complete the 2018-19 Federal Work-Study Wait-list Form. Have the Homeland Securit y Form I-9 on file at Marshall University’s Human Resources Office, Room 207, Old Main. A sample of the form that you will complete along with a list of acceptable documents may be viewed at: www.uscis.gov/files/form/i-9.pdf. Please note that you must complete the I-9 in person. Complete IRS W-4 Form, which is located at http://www.uscis.gov/files/form/i-9.pdf, and submit it to the Payroll Office, Room 203, Old Main. Without this form on file your federal and state exemptions will default to single and zero. 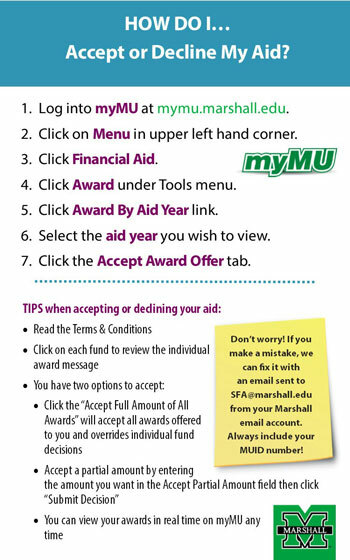 Complete a Marshall University Direct Deposit Form, which is located at http://www.marshall.edu/finance/files/Payroll-Direct-Deposit-Form.pdf, and submit it the Payroll Office, Room 203, Old Main. If you are hoping to work on campus, we encourage you to complete these tasks any time you are on campus including Green and White Days, New Student Orientation and Week of Welcome. The Marshall University School of Medicine Office of Student Assistance strives to meet your financial needs by providing funds through federal, state, and institutional programs. In addition, the office offers comprehensive financial aid counseling and debt management services. For more information on medical school financial assistance, visit the Marshall University School of Medicine Office of Student Financial Assistance website at http://jcesom.marshall.edu/students/financial-assistance/. Lora Varney in the Registrar Office at 304-696-2254 .